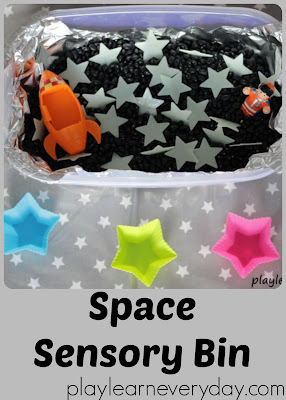 It's space week, and we're celebrating with a really simple to put together space sensory bin that toddlers and young children will have so much fun playing with and exploring. I set up the space sensory bin by lining a plastic container with aluminium foil to make it shiny (and to give a lovely texture and sound) then filled it up with black beans for the darkness of space. Then I added some glow in the dark stars and a few little space toys. I also found some little star shaped cupcake liners that worked really well for scooping and pouring. This is one of those sensory bins that needed no introduction, as soon as I placed it in front of Ivy she was straight in there. She loves scooping things up so she went for the star cases first and filled them up with the beans and began pouring them back out, this activity alone kept her busy for quite some time. Then I encouraged her to have a look at some of the other things in the sensory bin. So she started picking up the glow in the dark stars and hiding them under the beans (this would be a great thing to do in a darkened room, trying to find the glowing stars). She also counted the stars as she pushed them down into the beans. She also played with the little astronaut and his rocket ship, putting him inside and having him zoom around through the spacey bin. Even clean up can be part of the activity! I always find with sensory bins that Ivy gets to a point when she's tired and she's just had enough, and that's when she starts to throw things around. Whenever she does this I quickly pick up the bin and move it out of the way (before she can tip the whole thing over!) and then give her a smaller container to use to collect all of the bits that she has thrown. This is great for her fine motor control as she is picking up individual beans from the mat.